ROOT CANAL THERAPY (a root canal) is a common procedure that can restore an infected or damaged tooth to its natural function. Despite popular myths, it is typically no more painful than filling a cavity. If a cavity is deep enough, the tooth can become painful or infected. Left untreated, this could lead to bone loss in your jaw as well as other systemic health problems. Cracked or damaged teeth (where your tooth’s nerves are exposed) may also require a root canal. 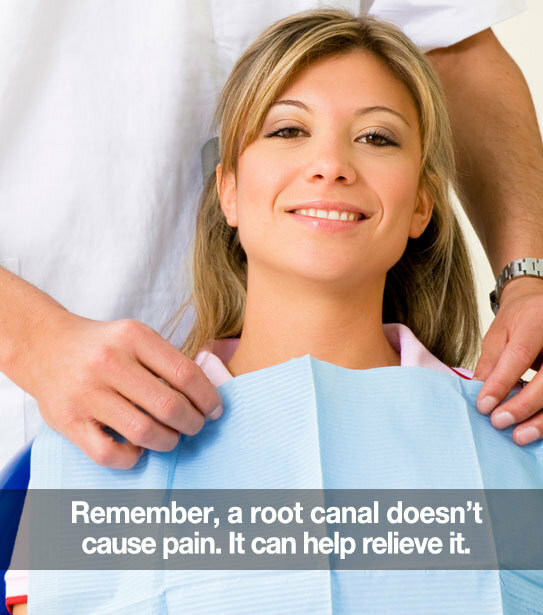 When a root canal is performed, your tooth’s canals are cleaned of bacteria and infected tissue. It is then sealed with a dental material and often a crown or gold or porcelain filling is placed over your tooth for further protection. Saving a tooth with root canal therapy will help to keep your teeth in alignment and allow you to continue to function efficiently. It also may require you to protect your tooth with a crown or a gold/porcelain onlay so it will not fracture or break. Although a root canal could be indicated, unfortunately, sometimes there is just not enough tooth structure to restore the tooth to proper form and function. As a result, we are instead having a discussion for tooth replacement. However, before any treatment is started, all options will be given to determine the best long term outcome. Root canal therapy is one of the most common dental procedures—nearly 16 million are performed in the United States alone each year. Today, with safe and effective anesthesia, precise tools, and incredible imaging technology a root canal doesn’t have to be painful—in fact, it relieves pain. Although we are experienced in root canal therapy, often we are referring patients to a root canal specialist. Please, if you have any questions or concerns, don’t hesitate to ask us. We value and appreciate your trust.